Since the first settlement days of New Amsterdam in the 17th century, Lower Manhattan development has been fueled by commerce and immigration at the South Street Seaport. Built on the twin pillars of free government and open commerce that have engendered the American experience, the combined shoreline and upland reaches of the South Street Seaport remain one of only a handful of precious historic sites in the nation that authentically represent and convey the beginnings and longevity of those roots and traditions. This utterly unique and irreplaceable heritage compels the City and State of New York, along with its federal and private partners, to design and execute redevelopment programming that gives equal weight to preserving all facets of the historic milieu that is the South Street Seaport District, while generating economic rejuvenation and the resiliency needed in today’s changing climate. For nearly five decades, redevelopment efforts have proceeded in fits and starts with dogged—but too often limited—success in sustaining classic examples of great sailing ships, creating a community of support, and establishing the financial streams needed to operate and maintain this multi-asset district. 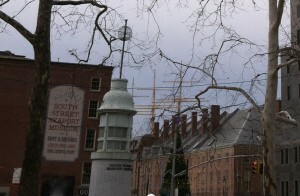 To sustain this growing residential neighborhood, popular tourist destination, and commercial center, the current redevelopment plan will sacrifice the Seaport’s historic integrity in a leveraged sellout of view corridors, vistas, and the precious historic character of the District in a deal to gain access to hedge-fund financing. Trading the last vestige of an earlier Manhattan to supplant proper public financing with private venture capital adds insult to the injury suffered by years of demolition-by-neglect, battering from two hurricanes, and back- room dealings designed to benefit the few. Friends of the South Street Seaport and other communities of interest call on the Mayor of New York City and all participating or affected agencies to restore transparency, due process, and fair return on public assets to the Seaport redevelopment process, and put historic preservation at parity with private profit. We ask that the Due Process/Transparency elements set out below be instituted immediately to conform the current development planning to the letter and spirit of both environment and historic preservation laws and regulations to prevent what the law calls “the introduction of tangible and intangible elements that compromise or diminish the characteristics for which an historic or cultural resource has been determined significant.” In the event these process and transaction elements cannot be included or accomplished, we ask that City and State leadership in all affected departments act on recommendations of the Seaport Working Group and form a Task Force to consider the options discussed in the Alternatives section of this paper and proceed to implement the most viable. To date, redevelopment activities at South Street Seaport sponsored by the NYC Economic Development Corporation (EDC) have treated preservation as an inconvenient impediment to circumvent; demolition and construction is proceeding based on limited environmental review and without formal consultation with the State Historic Preservation Office. Permits and approvals are granted for designs or scopes of activity that change or expand, often without re-evaluation or compliance assurance. Recently, the EDC announced its intention to seek approvals to remove portions of the historically registered Tin Building and register-eligible New Market Building to alleviate deterioration the EDC itself was obligated to prevent under New York landmark law. Since first suggested in 2008 by the HHC/SSSLP predecessor-in-interest—and rejected by the Landmarks Commission—redevelopment plans have openly or surreptitiously included a luxury residential tower building on the East River shoreline immediately proximate to the Seaport Historic District, blocking current viewscapes and sight lines. In spite of historic preservation law and regulation, land use laws, and environmental review requirements, transparent due process has been circumvented in favor of side deals offering physical amenities designed to mask the enormous value embedded in the Historic District assets being given away. A. EDC publicly provides a full current inventory and appraisal of all built, natural, and financial assets, tangible and intangible, in the Brooklyn Bridge Southeast Urban Renewal District/South Street Seaport Historic District (“the District”) owned or controlled by City agencies on behalf of the public, including but not limited to, land, leaseholds, buildings, air rights, and water rights. D. EDC and HHC/SSSLP reconfigure the development model using operational and financial return calculations that 1) reflect the full market value of the District in light of the significant growth in residential and tourist traffic from 9/11 recovery and 2) do not rely on profit margins from unit sales in a non-conforming, out-of-scale building on the shore periphery of the District. These revised calculations should be made part of the public record. E. Federal and State agencies responsible for permitting and other oversight of built, natural, and historic assets identify lead and cooperating agencies and conduct a full, unsegmented environmental impact analysis of the complete redevelopment plan for the District that complies with SEQRA, including formal consultation with the State Historic Preservation Officer open to public participation. F. EDC/HHC/SSSLP repairs and develops the Tin and New Market Buildings (including substructure below the water line) as dedicated public space in compensation for eliminated public space in Pier 17. G. HHC/SSSLP applies additional air rights, whether held or purchased, to the additive space created by enclosed or semi-enclosed floors and spaces in the Pier 17 project that exceeds the original design basis, including design improvements intended for expanded use of the roof surfaces. As part of its efforts to support important economic, affordable housing, and other public building needs, New York City has developed procedures whereby it leverages the capital investment potential of the private sector in development projects, intending a win-win outcome by allowing some portion of a project to make profits while other portions serve public needs like schools, recreation areas, or libraries. Although well intentioned, public assets contributed to such private development projects are often far more significant in value—financially, environmentally, and historically—than is understood by, or disclosed to, the public whose assets are being leveraged. Moreover, once permanently removed from the public domain, vital public assets of this nature are too often irretrievably lost to future public access and use. Ultimately, such development projects are worth undisclosed millions, continuing profits from which are not destined for City coffers, even though financial burdens (such as tax expenditures) are shifted to, and carried by, the public fisc for many years. In the case of the South Street Seaport, two previous efforts at private sector leverage have been less than successful. However, in the aftermath of the World Trade Center attacks, the rebuilding of downtown Manhattan has attracted major commercial (Technology/Advertising/Media/Information or TAMI), residential, and tourist development. In spite of condition issues, thousands of new residents and millions of visitors are generating higher market value for the public assets of the Seaport Historic District than the current development data imparts to the public. A. Historically appropriate redevelopment by a not-for-profit corporation/organization with community representatives as board members. Funding can come from viable combinations of City and State funding, and triple tax-exempt bonds available from the Build NYC Resource Corporation to finance construction and renovation that retains public use of public assets. 2. Use of an existing Public Benefit Corporation such as the Battery Park City Authority or Lower Manhattan Development Corporation as the redevelopment agent for the Seaport District. As a fifth century of unparalleled history unfolds in the South Street Seaport’s rich and storied locale, securing and sustaining this irreplaceable historic asset is the first priority for New York City government. The Mayor must act in concert with Federal and State oversight agencies to transform the planned private development into a transparent process that both meets legal and regulatory requirements, and eliminates the leveraged sellout of historic character and vistas for non-conforming infrastructure. In the event the current plans cannot be modified, and in keeping with the recommendations of the highly successful Seaport Working Group report, alternative development programming using established City and/or State public finance practices should be instituted as soon as possible.